Hanging over the start of the Cannes Film Festival today was the incessant discussion over the selection of two films produced by Netflix to appear in competition. It was all anyone attending Cannes, and especially those that aren’t, could talk about. So it was inevitable that this year’s Cannes jury would be forced to address the issue in a way that would make headlines even before the opening night film premiered. The “controversy” began in April, when festival programmers stirred up a hornets nest by inviting “Okja” from Korean director director Bong Joon-ho (best known for “Snowpiercer”), as well as filmmaker Noah Baumbach‘s “The Meyerowitz Stories”, to screen in competition at the the 70th anniversary of the world’s largest film festival. The movies themselves weren’t the problem, but rather the company that financed and produced them. For those just arriving on planet earth, Netflix is the world’s largest video streaming subscription service, available in 190 countries. They have a standing distribution policy of only releasing movies in cinemas day-and-date with their availability on Netflix, or not at all. This argument evolved into an existential debate on how a movie should actually be defined and the merit of cinema-going as preferential to streaming films online. Should the venue and method in which a movie is presented make a film any more or less valuable as cinematic work? This was the question journalists from around the world were itching to ask jury members during their brief press conference this afternoon at the Palais des Festivals. 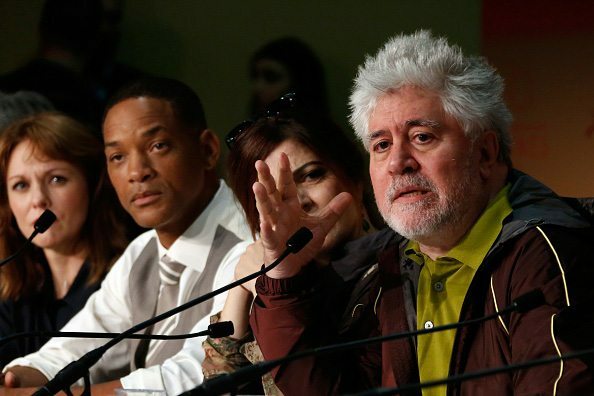 This year’s jury is presided over by Spanish writer/director Pedro Almodóvar, who is best known for movies such as “Women on the Verge of a Nervous Breakdown”. A Cannes veteran, seven of his films have appeared in previous festivals. Joining him are filmmakers Maren Ade of Germany, Park Chan-Wook from Korea, and Italy’s Paulo Sorrentino, along with actors and actresses such as Fan Bingbing, Jessica Chastain, Agnès Jaoui and Will Smith. French music composer Gabriel Yared is also on the jury. Though there were murmurings amongst the press corp over who should ask “the Netflix question” and to which jury member it should be directed, it wasn’t until the 18th minute that anyone was brave enough to do so; a journalist from Almodóvar’s home country. Almodóvar wisely expected the topic to be raised, so much so that he prepared a written statement, in response to what he deemed the question of this year’s festival. What those in attendance believed heard Almodóvar say is that he would not award either “Okja” or “The Meyerwitz Stories” the festival’s top prize, the Palm d’Or, because they were Netflix films that would not be shown in cinemas. In the filmmakers defense, his intention was to say that movies should not win awards at film festivals if they can’t then be viewed as they were intended to be seen, in movie theatres. Yet if one does the math on his statement, since it appears neither of the Netflix Cannes entries will make their way into cinemas, it would stand to reason by Almodóvar’s thinking they shouldn’t win any awards here. From there, the questioning of the jury members moved on to more important matters, such as whether anyone would try to outdo actress Kirsten Dunst, who as part of last year’s Cannes jury, who wound up wearing 28 different outfits to screenings and red carpet premieres. American movie star Will Smith took up the challenge by joking that he would try to surpass Dunst by donning 32 stylish outfits. And just as it seemed as if the subject of Netflix had been extinguished, Smith quite purposefully and unprovoked reignited it. There are so many aspects of what Smith said about Netflix on Wednesday that deserve to be called out. First and foremost, Smith is hardly unbiased when it comes to Netflix. The streaming company spent a reported USD $90 million producing the upcoming action/thriller “Bright” in which Smith stars. Secondly, the fact that his children are able to attend movies in cinemas twice a week is not the norm for most people, though neither is the multi-million dollar salary Smith earns every time he stars in a blockbuster. Finally, if streaming movies and theatrical films are two different forms of entertainment, as Smith argues, then why should they be selected and judged together in a festival that has traditionally focused on the latter? By the end of the press conference only two things were certain; the debate about whether Netflix films should be allowed to appear in Cannes would rage on, and journalists from around the world had their story for the first day of this year’s festival thanks to Almodóvar and Smith’s comments on the matter.